Our research objective is the phenomenon of fake news. We claim that fake news is not one thing, and also not a new phenomenon. Rather we would like to offer a new conceptualization by visualizing the various levels of fakeness in the news and its distribution. Our aim is to create a visualization that will try and conceptualize the term in new ways. 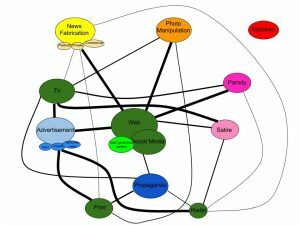 In order to do that, we created a graph that tries to represent the different kinds of fake news and their connections to different mediums. To do this, we use the theory of affordances, from the angle of social affordances, to show to what extent each medium affords each type of fake news. This conceptual visualization can be seen as a way of exposing the infrastructure that allows fake news to exist and circulate. In order to answer our research question, we first had to find a meaningful definition to the term fake news, that will distinguish between the different kinds and conflicting definitions. During the 2016 US elections, fake news became a main topic of discussion (Alcott and Gentzkow 2-4) and was presented as a rather new phenomenon in the Western world. But in fact, this phenomenon is not new at all. News in all kinds of forms is biased in some way because it is created by people from different backgrounds with different agendas and intentions. In spite of that, we believe there is some sort of news that can be called real news, that at least aim at being true and representing an accurate picture of reality to their audience. During the last presidential election, Hillary Clinton’s followers claimed that Russia was aiding Donald Trump by circulating fake articles about her and her campaign. Trump, on the other hand, attacked traditional media outlets claiming the way they cover his campaign was fake news (Alcott and Gentzkow 2-4). Both presidential campaigns were referring to different kinds of fake news, both in means of production and in ways of distribution. Although its recent prominence, the notion of using fake news in trying to affect people’s views has existed since the invention of mass media (Tandoc Jr., Lim and Ling 11). These different kinds of fake news are created with different goals and will be explained more elaborately below: parody and satire are both created with the intention to amuse the receiver and are known to be fake. Whereas news fabrication, photo manipulation, advertising, and propaganda are all created to deliberately influence or mislead their audience. News Fabrication is the type of fake news that emerged from the 2016 US elections and is usually spread with the goal of making money from the associated advertisements (through i.e. Facebook or Google AdWords) or to influence politics like we saw last year. A lot of outlets that spread fabricated news actually create this using bots, that also accelerate the spreading of the fake news. Photo Manipulation has become easy with digital images and the wide availability of editing programs. Most legit news outlets have rules that disallow journalists to change the context of a photo, but these kinds of rules do not apply to the web and social media. According to Allan Sekula, the original photograph used to be a “trace”, but when digital photography came up, this trace idea disappeared (Emme and Kirova 146). As consumers might still have the idea of this “trace”, photos are more likely to be trusted than just text, which makes consumers vulnerable to photo manipulation. Propaganda has been around for a long time. Doob defined it in 1948 as “the attempt to affect the personalities and to control the behavior of individuals toward ends considered unscientific or of doubtful value in a society at a particular time” (240). Propaganda is published by outlets that are (or seem to be) legit, which makes it very influential. An advertisement appears in seemingly genuine news articles more and more. The news does not necessarily contain (a lot of) false information, but will always overly emphasize the positive aspects of the advertised entity. Some news outlets will add a note that labels the article as “sponsored”. News Satire is meant to amuse but is based on actual news. Comics do tend to bring up very serious subjects and present them with a humorous note. It turns out that people who watch satirical programs are usually just as informed about the news as people who consume traditional news (Kohut, Morin and Keeter n.p.). This is concerning because one might be slightly misinformed or biased by the satirical program. News Parody is also meant to amuse. Sites like The Onion (or De Speld in The Netherlands) publish articles based on current affairs, but they are completely false. Presenting the article like a legitimate news source does confuse in some cases though. The assumption that both creator and consumer are aware that the “news” concerns a joke, does not always hold up. Fake news also has different contexts in different regions of the world. While the most prominent debate in English written articles is about the United States election, in China, for example, fake news holds a different meaning. As China is a one-party state, traditional news outlets and online media are censored by the government. Propaganda is the dominant type of fake news, while paid news is another important branch (King, Pan and Roberts 4-6). This all shows that fake news definitions are flexible and can change. After looking at the different kinds of fake news and the different media types that allow them, we decided to create a graph that represents the connections between each type of fake news and each media type, to show what type of fake news each medium affords. For example Social media affords user-generated content, advertisement and paid editorial content. TV affords other types of fake news but does not allow others, and so on. We tried to create some scale that shows the weight of the connection, but it is quite subjective. More research needs to be done in order to determine an empirical way of making the scaling. To explain this way of representation, we use the theory of affordances, that has spread widely in new media studies. One understanding of the term affordances is offered by Ian Hutchby and Simone Barnett, who present communicative affordances as “possibilities for action that emerge from […] given technological forms’”. According to Hutchby and Barnett, affordances can also shape the conditions of possibility associated with an action. It may be possible to do it one way, but not the other (151). For example, social media affords individuals with no professional training and various intentions to create and distribute user-generated content and advertisements online with the widespread use of the internet. Online websites and social media thus afford all kinds of fake news we discussed. Print media, as a platform to publish articles and pictures, usually does not afford news satire and parody. Besides, print media is considered also more reliable and traceable, thus affords less news manipulation than online media. In the future, this kind of understanding can be used to create a tool that will allow users to analyze the articles they read and understand where they stand in the graph. In the graph, the more a medium allows a type of fake news, the bigger the node is, and the edge between the specific nodes becomes wider. The graph is based on the table below. The weights of the edges in the graph are based on Table 1, this is just an example, based on our own intuition. We intentionally do not create a hierarchy between the different kinds of fake news, because, as we displayed earlier, the news people consume is moving more and more towards the internet and social media, which also makes the boundaries between mediums vague. For example, when users see in their Facebook or Twitter news feed an article from “The Onion” or from “The New York Times”, they don’t have a different framing or hierarchy that differentiates what is real news and what is a parody meant to amuse. This creates a situation when hierarchies between reliable news sources and fabricated content or satire no longer exist, in the flow of news feeds or the algorithmic organization of Google news, they all appear as the same. This is another level of how social media and the web afford or normalize the different types of fake news. In recent days, since the emergence of the internet as a main tool to distribute news and with the growing prominence of social media as platforms for news consumption, it is becoming harder and harder for news consumers to distinguish what is valuable and reliable reporting and what is amateur reports, false propaganda or advertising. The demand for fast news comes before the need to verify facts. And user-generated content that consumers encounter incidentally, decontextualized from the source, undermines the value of traditional journalism (Chen, Conroy and Rubin 1-3). New technologies allow better and more advanced ways of fabricating photos, sound bites and even videos. All of this calls for intervention to create better digital literacy among news consumers. As an example, we would like to discuss the new meanings video and photography can receive online. These are mediums that were considered more reliable and harder to fabricate and this example illustrates the relevance of our research. According to McKain, people view live broadcasting television as the only source which might be transparent and that is not exposed to manipulations. For example, when a major network is reporting on-site and live, people will immediately believe that this is a source from the so-called first hand. But McKain is telling us that in our times this is no longer true. Even when it may look like the reporter is presenting live and on-site, in many cases, it is not, because even location and background can be re-constructed nowadays, with available technologies (417). Online videos can also be created with false content and the new technologies that are available to edit them make it harder to see that as a viewer. Jewitt and Oyama argue that the structuralist semiotic conception of communication in video and photography is built around a system of universal cultural related codes, that must be supplemented by a “social semiotic” where images serve as resources (134). This means that people take these videos and images for granted because it was presented as “normal”. The viewer is not critical about what they are watching. To make the viewer aware of this problem, the photo and video manipulation topic should be differentiated in three kinds of meanings of communication: “representational meaning, interactive meaning, and compositional meaning”. These mean the ways the image was presented, the way the maker of the image intervened in the situation and his presence changed it, and how he made a new composition of the situation in the video itself (Jewitt and Oyama 140). This exemplifies that the difference between online videos and live-broadcasted news online is diminishing. They are both online and can be manipulated with different technologies. Our theoretic intervention is made to create awareness, and can also be seen as a form of exposing infrastructure. Mattern writes about exposing media infrastructures and the need to map these large and sophisticated phenomena. She quotes the work of Ian Bogost, that “recommends several ways to describe our new networked, infrastructural existence, including ontography” (n.p). Our visualization can be seen as a kind of ontograph of fake news because it uses the system of categorizing the different kinds of fake news, and draws attention to the couplings and connections between them and between different forms of media. Mattern gives examples of various kinds of these interventions and infrastructural exposures in different modes and notes that it is hard to know what will be the long-term influences of them. In that way, we are not trying to eliminate fake news but to make people look at all of the news they consume in a more critical way. There are a lot of attempts to completely eliminate fake news, mostly without much success. We believe that although it might not be eliminated, understanding the processes behind them, or the media infrastructures that afford them, might help diminish their effects. Further research could be done on mapping the different definitions of fake news in different countries and regions in the world. Different countries have different systems and different cultures of news consumption. We would like to know if different kinds of democratic systems influence the production and distribution of fake news. Allcott, Hunt, and Matthew Gentzkow. “Social Media and Fake News in the 2016 Election.” National Bureau of Economic Research Working Paper 23089 (2017). Chen, Yimin, Niall J. Conroy, and Victoria L. Rubin. “News in an online world: The need for an “automatic crap detector”.” Proceedings of the Association for Information Science and Technology 52.1 (2015): 1-4. Doob, Leonard. Public opinion and propaganda. New York: Henry Holt and Company, 1948. Emme, Michael J., and Anna Kirova. “Photoshop Semiotics: Research in the Age of Digital Manipulation.” 31.1 Visual Arts Research (2005): 145-153. Hutchby, Ian, and Simone Barnett. “Aspects of the sequential organization of mobile phone conversation.” Discourse Studies 7.2 (2005): 147–171. Jewitt, Carey, and Rumiko Oyama. “Visual meaning: A social semiotic approach.” Handbook of visual analysis. London, Thousand Oaks and New Delhi: SAGE Publications, 2001. 134-156. King, Gary, Jennifer Pan, and Margaret E. Roberts. “How censorship in China allows government criticism but silences collective expression.” American Political Science Review 107.2 (2013): 326-343. McKain, Aaron. “Not Necessarily Not the News: Gatekeeping, Remediation, and The Daily Show.” The Journal of American Culture 28.4 (2005): 415-430. Tandoc Jr., Edson, Zheng Wei Lim, and Richard Ling. “Defining “Fake News”.” Digital Journalism 5. (2017): 1-17.